Portfolio of top three IAS officers -- Rajhans Upadhyay, Rajeeva Swarup and Pawan Kumar Goyal -- was alleviated, according to an official order released late last night. 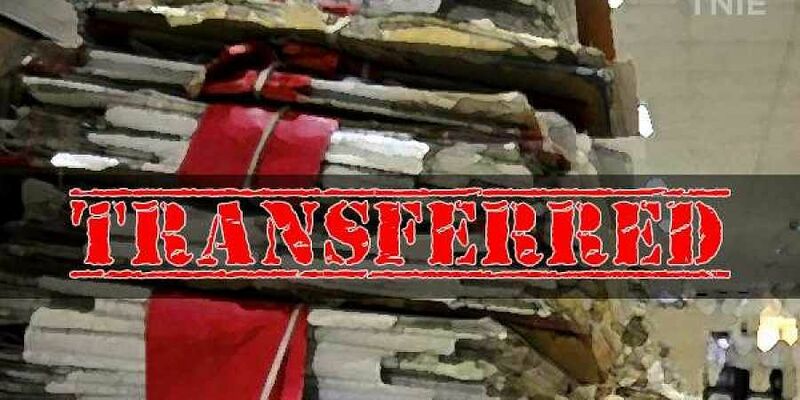 JAIPUR: In a major bureaucratic reshuffle, the Rajasthan government has transferred and redesignated 30 IAS and 75 IPS officers. Upadhyay, who was holding post of chairman and managing director of the Rajasthan State Road Transport Corporation (RSRTC), will now be the chairman of the corporation. Additional chief secretary Rajeeva Swarup has been relieved from the micro, small and medium enterprises (MSME) portfolio but will continue to hold wide range of industries portfolio, including of the Delhi-Mumbai Industrial Corridor and RIICO chairman post. Another IAS officer of additional chief secretary rank Pawan Kumar Goyal has been relieved from the local and self-government department and will continue to head the urban development and housing department. Naveen Mahajan, who was secretary local self-government department, will now be secretary of the MSME department. Udaipur divisional commissioner Bhawani Singh Detha will be now divisional commissioner of Ajmer. Agriculture department commissioner Vikas Sitaramji Bhale will now be Udaipur divisional commissioner. Jaipur Municipal Corporation (JMC) commissioner Ravi Jain will now be the director of the agriculture department. Commissioner school education Dr Joga Ram will now be additional chief election officer. Director agriculture marketing Sube Singh Yadav will now be special secretary disaster management and Urmila Rajoria will be managing director of Rajasthan Financial Corporation (RFC), says the order. Posting of Rukmani Riar has been kept under the awaited order category. Minor changes have been made in portfolios of three IPS officers of additional director general of police (ADGP) rank. The ADGP (law and order) will now be special director general of police (law and order), ADGP Anti-Corruption Bureau (ACB) Dr Alok Tripathi will now be DGP of the ACB and ADGP (Jail) Dr Bhupendra Singh will now be DGP (Jail). Inspector General of police (vigilance) Smita Srivastav has been shifted to Armed Batallion-2. Additional commissioner-1 Prafulla Kumar will now be DIG of Anti-Terrorism Squad (ATS), additional commissioner-2 Dr Nitin Deep Blaggan will be additional commissioner-1, Jaipur. U N Chanwal, who was in awaited posting order, will now be DIG (training), Superintendent of police (SOG) Sanjay Kumar Shotriya will now be DIG (crime branch), while DIG police welfare Surendra Kumar Gupta will now be DIG of ACB. Four superintendents of police have been given the DIG rank posts. SP Ravi Dutt Gaur and Laxman Gaur will now be DIG Armed Batallion, Jaipur, and DIG crime branch, Jaipur, respectively, whereas SP GRP Jodhpur Lalit Maheshwari and SP Chittorgarh Prasann Kumar Khamesara will now be DIG Jodhpur jail and DIG (police personnel), Jaipur, respectively. Elections to the 200-member Rajasthan state assembly will be held this year-end.